Bless your little brother on Raksha Bandhan, from miles away with this Amazing Rakhi Gift embellished with a Rakhi, Roli Tilak and Chawal free of cost. 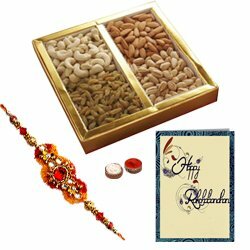 This Gift contains assorted Dry Fruits along with a Rakhi Set. This Gift is beautifully decorated and presented. Mixed Dry Fruits 1 Kgs. (Gross Weight) with a Free Rakhi, Roli Tilak and Chawal.